el Cubana - Ready Steady Gone! “It was a busy and exciting time in the late fifties for me in my late teens. Elvis Presley, Bill Haley and the Comets were emerging and big bands were the norm. As well as working at Priestman and Galen buildings in Green Terrace known as ‘Sunderland Technical College’, I somehow found time to organise dances at the Barnes Hotel and bus trips to Blackpool. Popular places at the time in Sunderland were the Seaburn and the Rink in Park Lane. There were occasional dances at Wetheralls on the Green opposite Bishopwearmouth Church, St Bennett’s Church Hall in Roker Avenue, Grange Hotel in Newcastle Road and of course the Barnes Hotel. We also had coffee shops, Notrianis in High street, Fellas in Silksworth Row and Binns Restaurant in Fawcett Street, which were meeting places for my group of friends and where we would sip coffee until we got kicked out for not spending enough. During one of our many Saturday afternoon meetings at Binns’ restaurant, gazing down Fawcett Street and dreaming up ways to kick the Sunderland scene up a notch, a group of us decided to open our own club. It would be devoted only to a certain selected age group and have dim lights and an intimate atmosphere. We agreed to meet each week at a church hall in North Bridge Street each putting in five shillings a week until we had sufficient funds to open our own magical club. In 1957 after many weeks of planning we rented a place in North Bridge Street in which to open a club. We named the club the Bridge Street Jazz Club. At the time, running private clubs was fraught with difficulties. They were not legally able to make a profit and the club had to be run by a committee. Any profits had to go back to the members. The founder members were Cliff Balbach, Brian Farquhar, Alan Rolfe, Alan George and myself. We became the committee. I soon realized that it would not work with a committee, so I resigned just as the club opened and I forfeited my money. (Technically speaking this was the first club in Sunderland). As I thought, the club closed after a brief period. Our attempts to kick Sunderland up a notch failed but my dream remained. Life rolled on and we all got girlfriends, wives etc. Around 1960, a big change came. The then Prime Minister, Harold McMillan, changed the law, making it possible to run a club as a proprietary club, (although technically they still needed a committee), but in reality the club owners could pay themselves wages. Lonnie Donegan had brought skiffle across the Atlantic from America, which gave rise to the groups we still know to this day. Tommy Steele was playing his guitar in the London coffee shops. These three events helped set the scene. Cliff Balbach and myself decided the time was now right to re-attempt to open a club. 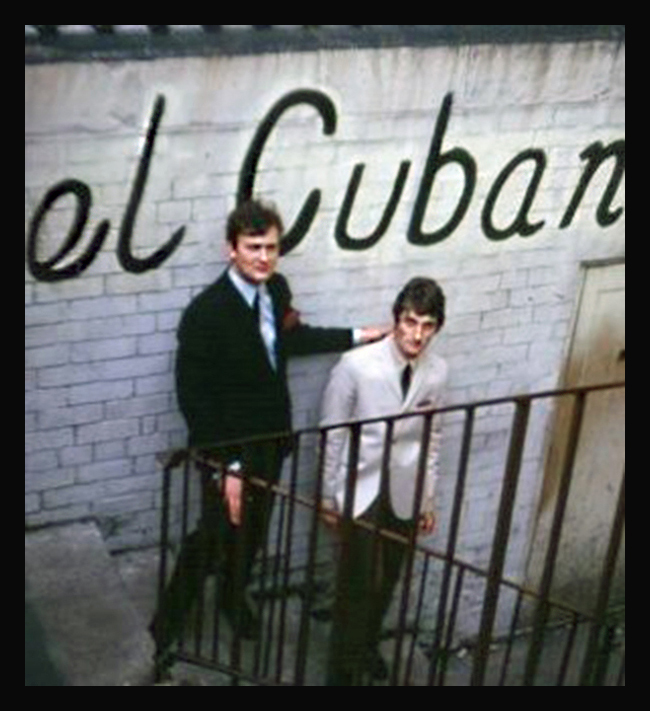 In 1961 with an enormous amount of help from my brother, David Punshon, we set about transforming 13 Toward Road, Sunderland (a five story building) into the el Cubana. We commissioned builders Ellis & Gowland (Billy Ellis & Arthur Gowland) to do the main building conversion work. Cliffs Balbach’s mother had given him £1000, Eddie and Hannah Punshon my parents gave me £500. McCann’s (Low Row) supplied us with the furniture on hire purchase. So for about £2000, plus a bank loan of £200 from Peter Smith, the manager of the District Bank in John Street, we eventually opened the el Cubana Coffee Club in the first and lower basements. The el Cubana was a teenage club. It was a magic place; the dance floor area was painted black, it sported reflective panels on the walls, hands and feet on the suspended ceiling above the dance floor, and a stage. Below the dance floor, a dimly lit cellar painted deep purple, in it a lounge and a coffee bar, which sold Coca Cola, orange juice, hot dogs, hamburgers and frothy coffee made of all milk. Live music in the form of groups was the norm. The groups all had their own distinctive dress. Real show business stuff. We had the famous ‘Limbo Poll’, which appeared while the group was on their break and every one would have a go. Fred Barnes, the doorman, would do his comedy act on stage. One night whilst Fred was telling his jokes on stage, a lad shouted, ‘Puff’ to him and promptly ran, swiftly followed by Fred. Everyone thought ‘Oh Crikey’! Fred came back, got back up on stage and said, ‘The lad had nothing to worry about – I only wanted to give him a kiss’. There was also the famous ‘Galloway’ oil painting, which graced a wall in the el Cubana (and later the Hot Spot), and which was featured on Tyne Tees Television. I still have this enormous painting hanging on my garage wall. Fourteen months after a prolonged battle with Magistrates to obtain a liquor licence, the La Cubana Nightclub opened above the el Cubana on the ground and first floors, both the el Cubana and the La Cubana were based on a Spanish theme. We found out later that the name ‘el’ Cubana, was grammatically incorrect as ‘el’ is masculine and ‘Cubana’ feminine. It’s like saying Mr Pauline! The plan was to bring in Spanish staff, but this was fraught with red tape, so sadly we had to abandon that idea. During the building process, I twice worked four days and four nights without sleep and my feet were ‘rotting’ (but that’s another story). 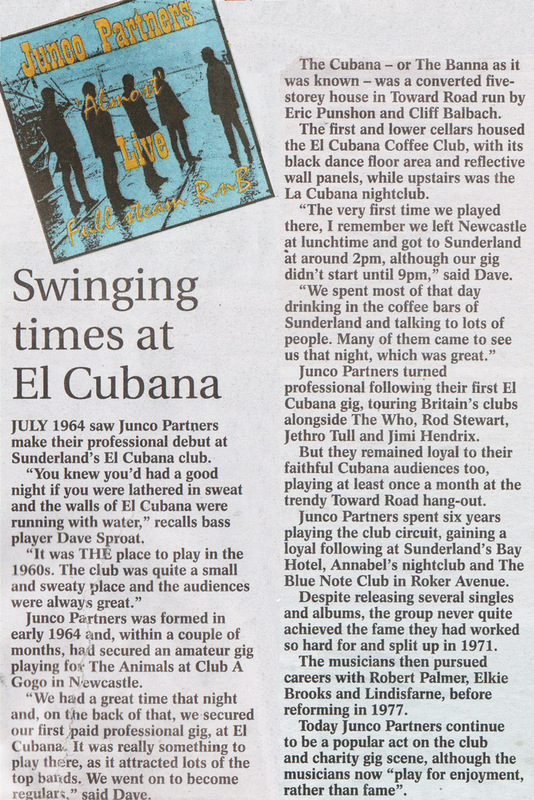 We announced the opening of the el Cubana with advertisements in the Sunderland Echo. On the opening night of the el Cubana we were hastily beating a retreat out of the back doors with rubbish as the first customers were coming in the front doors. I went home got bathed and donned my evening suit and returned to find the club full. Dress standard was very strict for the members. People tend to act the way they dress. Swearing was a no-no and attracted two weeks suspension of membership. The club always opened exactly on time. The formula worked and I continued these standards in the following thirty years in the Hot Spot and Rascals, which were the natural successors of the Cubana clubs. El Cubana in the early days ran two sessions, 7pm until 10-30pm and 11pm until 2am. Club 11 in Villiers Street had opened a short while before the el Cubana, but the el Cubana soon dominated the scene. Club 11 closed and owners Frank Pickering and Mike Pemberton moved on to other things. Sunderland went on to dominate the North East scene as other clubs started to open. There were La Strada, Wetheralls, Rococo, The Blue Note, Parama (later the Ku Club), and the Bay Hotel. Some of these did not last long. The Locarno (Genevieve’s) later called the Fillmore was where Geoff Docherty went on to promote the big name rock groups. In 1966, Club Annabel’s opened followed by other venues. In late 60s times began to change. The music scene was falling apart with some of the big groups going on stage in a very poor standard of dress and some being quite destructive and charging too much. Nothing like the real show business. This had a dramatic effect on the behaviour of the younger generation. The local council at around this time in their wisdom were busy slapping down double yellow lines everywhere, which had the effect of removing the older stabilising generation from the town centre. Yellow lines are fine during the day but they should not have applied, say, after 7pm. I decided I could not maintain the standard I had set. I decided to cease trading until things improved. I closed the el Cubana and La Cubana in 196?. I rented the premises out and it became the Courier Social Club. The groups that played at the club were supplied by the Jack Wright Agency and Ivan Birchall agency. The biggest highlight being the Spencer Davis Group, who played at the club the very night they hit number one in the charts with ‘Keep on Running’. Other groups to play were the ‘Steam Packet’ before they became huge in the music world, Long John Baldry and his discovery Rod Stewart, Julie Driscoll, Brian Auger & the Trinity Sound who performed together as the Steam Packet. Alan Price, John Miles, Brian Ferry, to name but a few, played at the ‘Banna before they became famous. We would get the big name groups of the time turn up in the early hours of the morning (after they had played at the Seaburn Hall, Empire or Odeon). Entrance to the basement of 13 Toward Road – previously the el Cubana. The big groups performed a 30-minute spot (for free), just so they could say they had played at the el Cubana in Sunderland and the Cavern in Liverpool. We were famous in the entertainment world. Apparently the acoustics in the ‘Banna were ideal for groups. The best group ever was called the ‘Jay Birds’, a bunch of session musicians from London who had joined up briefly and did a country wide tour just for the hell of it. They also wanted to play the Cavern and the el Cubana. Again this was one of those early morning gigs, free to us. They arrived and carried in a small amount of equipment, compared to the average band, we were wondering if we had made a mistake saying ‘yes’ to this unknown group. It proved that quality does not require quantity in terms of equipment in the hands of real professional musicians. They stopped the show by the sheer quality of their playing. Sadly for the world, it’s a tough job travelling, and they reverted back to session playing. Many of the big groups of the time had recordings enhanced by these guys in the recording studios – I wonder where they are now? The most popular regular local group to play at the ‘Banna was the Junco Partners, who are still performing to this day. I haggled many a time with John Wood their leader over the fee. They were the most popular and highest paid local group. Bernie Walsh, sax player with Paul Ryan and the Steaks performing at the el Cubana in 1962. A Club is only as good as the people it attracts and the success of the ‘Banna was the members. There are many notable members’ stories and events, which I could write about. The following members and staff spring to mind. I would be interested to know how their lives have panned out and what they are doing now. Fred Quinn, Joe McGough, Derek Robinson now owns Geordie Jeans with his brother, Judith Robinson his cousin. I bumped into Judith in a New Zealand vineyard Christmas 2003! Malcolm Laverick, Carole Smith (Ancona Street) married Keith Checkly, one of the members of the Kylastrons group who played at the ‘Banna, Diane Cooke who worked at Blacketts, Pauline & Pat Cohill, Linda Hall, Yvonne Weightman who was the legs in the famous advert for a petrol Company, Marjorie Hyam who wore a black cat suit and won the fancy dress, Linda Kempster, Norma Moore, Una & Pauline Lake, Nora Allen (I think she married a Sunderland footballer and went to Australia), Dorothy Clifford, Alice Hudson, Janice Parmley from Chester le Street, Moira Porter, Margaret Douglas known as ‘Spot’, Jeanie Nichol, Pauline Timiney, Ian Smith, Sandra Thompson, Iris Rumney, Anne Fearon, Gerry French, Ellis Holliday, Mike Elliott (appears on television as a comedian and later played the boxing coach in the hit movie Billy Elliott), Keith Miller, John Duckworth, Sam Barnett, Jenny Hodgson and not least many others. I keep in touch with Liz Yeo, and Leslie Scott a Sunderland Council leader and Mayor. Now the biggest surprise of all! There is an active ”el Cubana” society, held together by the afore mentioned Leslie Scott and his friends Dave Kennedy, Peter Newrick, Trevor Smith and Brian Snowdon. Along with the Junco Partners, they regularly run re-union Gigs (usually charity fund raising events). Since 2003 I have lived in New Zealand and am still in business. I hope many people have a lot of pleasure reading this brief article, as I have had writing it. Old friends of Eric and the Cubana clubs are welcome to mail him. 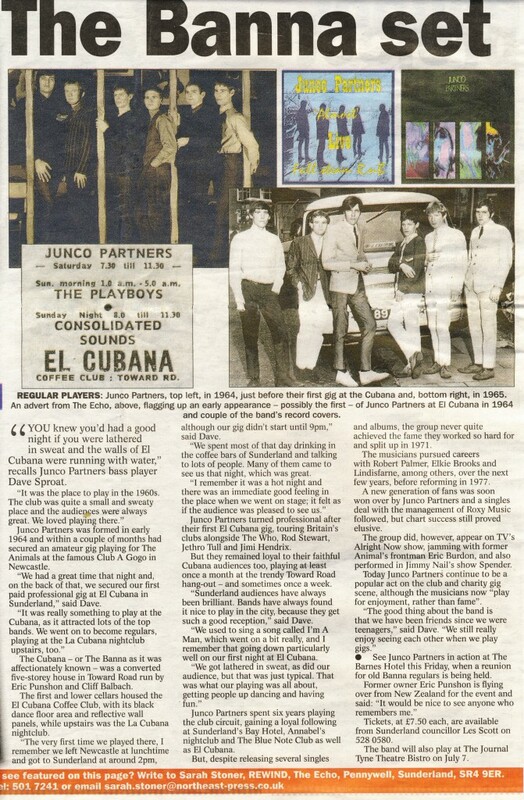 Former Lead singer with The Up Town Go Go Band,played El Cubana on numerous occasions.I am in touch with Eric fairly regularly.Fond memories of Sunderland and Newcastle.I f only gigging was as much fun for the young kids now. Happy memories from Billy Bain of the Phantoms we played most Saturdays from the opening for some months.Regards to Eric. Thank you, Eric, for the memories, and giving me so much in my youth. Being slightly younger, I only remember el Cubana coffee bar from the mid. sixties BUT I did see the Specer Davies group who stayed, after the gig, next to the bar. After getting thier autogrammes, I was thrilled when Stevie Winwood put his arm around me! So imagine my surprise seeing him at a gig here in Dusseldorf with Eric Clapton in 2010, and wearing the same (?) gear, jeans, white t-shirt und limberjack shirt. But he still looks good. What happy memories! my first husband, Maurice Rowe, played in a band called 'The Connaughts'. They appeared at El Cubana several times in 1963. In fact our first date was at el Cubana. What a great club. I think the fact that there was no alcohol on sale made it better. The young kids today don't know what they are missing by getting so drunk when they go out. Sadly Maurice died in 1994 aged just 50, but I have so many happy memories of el Cubana and also Club 11 where they played as well. Was just speaking to Frank Pickering the other day about it and he told me about your blog. Thanks so much fot the walk down memory lane, Eric. A friend and I were reminiscing today and she mentioned the existence of this site. What wonderful memories have been evoked by the above. We often went to La Cubana and El Cubana (mostly in late 1965 and 1966), spending many happy hours downstairs and somewhat fewer upstairs but remember in particular the Junco Partners (I actually bought a couple of their CDs recently) as well as visiting artists Alan Price and PJ Proby ... and Ollie (Nigel) Olsson also featured. In those days I was Minnie and she was Stevie. I am so impressed to learn of the existence of the society (and clearly remember Dave Kennedy, Peter Newrick, Trevor Smith and Brian Snowdon - what happened to their friend Willie Wilson? Was he another town leaver like me?) - I am not sure what the date of the above article is but do they still organise fund-raising events? I'd be fascinated to attend one should it happen when I make one of my very occasional visits to Sunderland/Newcastle. Was thinking of the good times I had at the hotspot with friends like Janice goudie. And of course I went out with Michael snaith for some time. It was great reading a blast from my past. Iam married now have a daughter 28 and a grandchild 2weeks old. Life changes I live in London now. I was a regular at La Cubana from about 64/65 to 66 with my friend Edith. I was then called Ann Hart.I remember Ian Jenkins on the door with a skeleton in a box which pinched your money. We were there for Spencer Davis and spoke to Stevie Winwood. I remember Ian Siddle who we used to see there. We really loved it. Oh for those days again. Willie Wilson is still around living in the Tyne Valley. He came to my 70th birthday party along with Dave Kennedy, Trevor Smith and Brian Snowdon. Peter Newrick was away on holiday. Hello Eric my name is Judith Wass maiden name Thompson. My Dad was good friend of Sandford Goudie And Norman Massey who both were in the off license business. I love the Banna clubs and Club 11 to name a few. Still living in Sunderland worked hard as a hairdressEr Wass Hair and danceD my nights away at Sunderland and Newcastle night clubs. Loved the sixties and pleased to say I get in touch with you on FB glad you are doing well, love your blog plus I enjoy all these memories god bless Eric and your family. Hi Eric, hope you well, I have just been talking about the hot spot and how much fun we had. We are having a school reunion from Fulwell Grange School, and a lot of the school went to the night club - great times - like Janice Goodie, me, the Lamports and many more. Do you have any photos of the 70s? I of course courted Michael Snaith many years ago. Look forward to hearing from you. Thankyou Eric (and Una on the door) for the El Cubana. It truly was a magical place.The music the atmosphere, walking down those steps into El Cubana it was all part of perhaps my first teenage encounter of an amazing new world. I remember the Junco Partners the excitement of listening to them play. Dancing for hours but always happy. I met Alan Wilson there who truly was my first love. I'm so glad El Cubana existed and I was part of it.